Registration is now open for NCTM's premier fall events—the 2016 Regional Conferences and Expositions and the new Innov8 Conference! Innov8 will be held November 16–18, 2016 in St. Louis, Missouri. 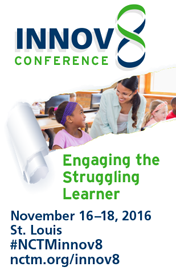 The theme of Innov8 this year will be "Engaging the Struggling Learner." 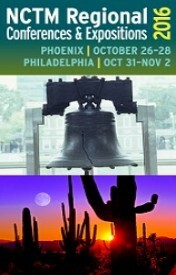 Visit the Innov8 Conference homepage for a video and details. Purchasing multiple memberships for your organization is easy and only takes a few simple steps. You can call NCTM Customer Care at (800) 235-7566, Monday—Friday, 8:00 a.m. to 5:00 p.m. ET, or email nctm@nctm.org, and explain that you would like to purchase multiple Pre-K—8 School Memberships. Learn more about NCTM membership options and how to subscribe. In the upcoming NCTM election, individual NCTM members will have the opportunity to vote for one candidate for Director in each of the following categories: President-Elect, High School, and At-Large. The election will be conducted exclusively online. 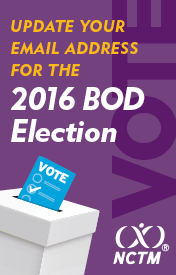 If your individual membership was current as of August 31, you will be eligible to vote in this year's election, which opens September 30. Applications for Mathematics Education Trust Grants are due November 4. Apply for MET grants, scholarships, and awards. Funding ranges from $1,200 to $24,000 and is available to help mathematics teachers, prospective teachers, and other mathematics educators improve teaching and learning of mathematics. Principles to Actions: Ensuring Mathematical Success for All has a new toolkit members can use to share with others. This toolkit consists of a series of grade-band-specific modules that are focused on a subset of the Effective Teaching Practices and professional learning resources that support implementation of the five guiding principles that Principles to Actions highlights in addition to Teaching and Learning: Access and Equity, Curriculum, Tools and Technology, Assessment, and Professionalism. Check out the e-seminars and consider an e-membership as a cost-saving measure. Note that April 2020 is the transition year, and NCTM will have a special Centennial Conference in lieu of the Annual Meeting. The Annual Meeting will resume in October 2020 in St. Louis.